I always love color. You really should see my closet. I'm not shy of color by any means. But, don't get me wrong I do love my black and my basics. But every now and again I love to throw some color into the mix. I've been trying to challenge myself lately with color. I feel like cold hit Chicago and everyone puts the color away. So before it got too cold I had to bust out some color. What do you think? Not a color combination you would normally see. Anyone else need a SNOW DAY today? This pop of color is perfect! Such a great look. I LOVE this combo so much! that bag is amazing as is the coat. Great styling. Hey Girl Hey!!! Love this look, especially the accessories. LOVING everything about this look!! That citrus color looks so great on you! Love this pop of yellow bag! Love everything here from that gorgeous bag to that killer jacket! And those cage sandals- yes, ma'am! This is very nice colour and you really look great on it. Love the heels too. I love the pops of yellow. This outfit is just so chic! Perfect color combination! Love the jacket! I love a pop of color! 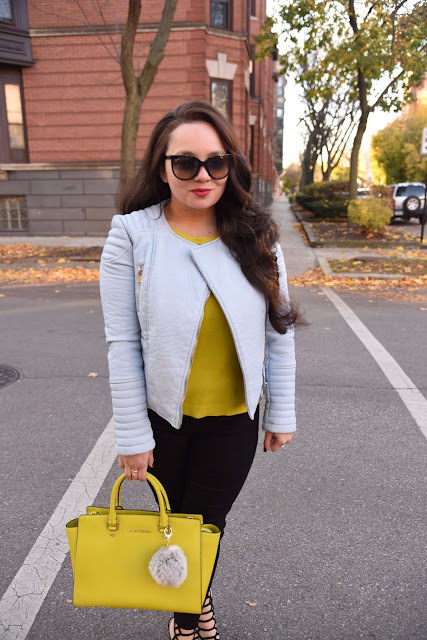 Yellow is my favorite color to add to a neutral look. So pretty girl!